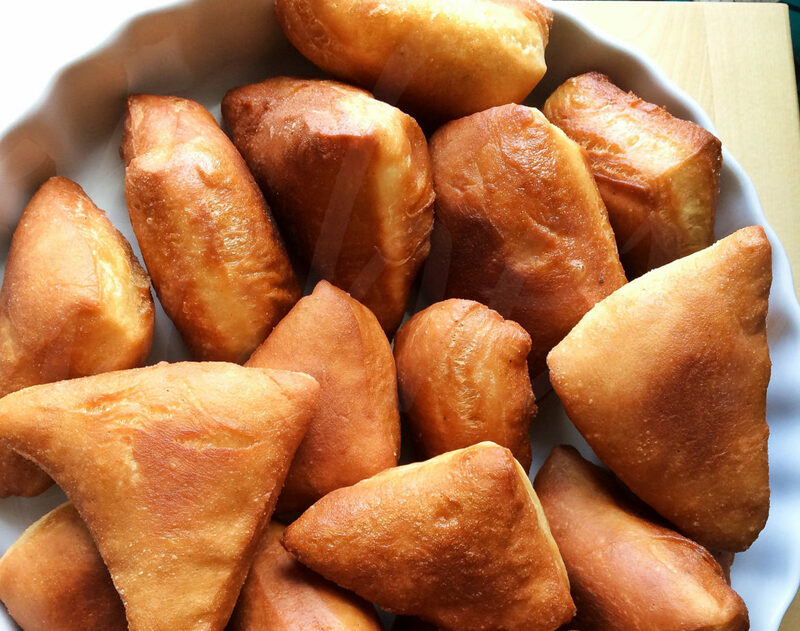 Mahamri, and it’s less flavour intense twin Mandazi is a breakfast street food. Mahamri accompanies other meals like lentils and grilled meats. This snack which is originally from the Kenyan coastal region unites Kenyans regardless of tribe, economic status or age. Ironically, I grew up eating them but only learned how to cook them last year. The need to get to cook different Kenyan cuisines came with having children. It is imperative to me that my sons grow up being as much Kenyan as they are Danish. However, our geographical disposition puts me at a slight disadvantage, but that doesn’t stop me from directing my sons to their Kenyan roots whenever possible. I think the best way of shaping a child’s imagination is through books, language, music, travel and food. My eldest son, Fadhili, has come to identify with his Kenyan identity through these aspects, my youngest one is still figuring out his way around walking and falling. In my pursuit to find books that are written by Kenyans for Kenyan children (at least), I came across A Tasty Mandazi, an interesting Kenyan Children storybook. Fadhili loves the book as much as he loves his Mandazi. He will eat Mandazi/Mahamri every day, for breakfast, lunch and dinner, if we allowed him to. You can also make this simple snack, and eat as an accompaniment of legumes, creamy chai, or by itself. I love to slice mine open and spread some cheese or jam. You can do the same too. Mahamri - A kenyan snack infused with coconut & cardammon. Sieve the flour, cardamom, salt, cinnamon, sugar, coconut flakes and sugar together in a large bowl, add the yeast into the dry mixture. Gradually add the coconut milk while kneading the dough. Place the dough on a dusted surface and continue kneading, add flour if the dough is still sticky, or a little coconut milk if the mixture is too hard. Keep kneading for 10-15 minutes, the more you need, the softer the mahamri. Cover with a cling film or a clean cloth (never use foil paper as it hardens the dough), the dough to rise in warm place for 2 hours. 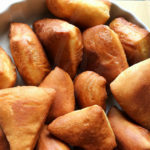 (When the dough has risen you can store it in the fridge if you intend to cook the mahamri/mandazi the following day). Make the dough into a ball shape, divide it further into two balls and then roll out each ball onto a floured surface, cut these into uniform triangular pieces. Leave these shapes to rest for 30 minutes to one hour. In a deep (circular) pan, add the vegetable oil half way into the pan, or at least 3 inches from the base. Let the oil heat up to 180 degrees. You can also test the oil temperature with a wooden spoon, if the oil sizzles when the spoon touches it, then it is hot enough. Make sure the oil isn’t too hot as this will quickly brown the mahamri without cooking them inside. Gently drop the mahamri into the oil, preferably four at a time. Use a deep frying skimmer or a wooden spoon to them out of the oil, and place the mahamri on paper serviettes. Enjoy the Maharmi with a perfect cup of chai.